It’s that time again. Gelmaxx is preparing for the World of Concrete 2014 (WOC) in Las Vegas, Nevada! If you have never been to this event, then 2014 is your year to catch it all. WOC is a packed, high energy trade show that brings in suppliers, vendors, manufacturers, and contractors from all over the world. This will be the second time that Gelmaxx will exhibit at the World of Concrete on the outdoor silver lot at booth #031335. The show is from January 21-24, 2014. What is the World of Concrete? To find out more about WOC 2014 or to sign up, click HERE. Since Gelmaxx is part of the Concrete Sawing and Drilling Association (CSDA), we are proud to offer FREE attending registration, courtesy of CSDA! Click HERE to register for free. What’s new with Gelmaxx Slurry Solutions? We have come a long way since we first premiered in last year’s show. Gelmaxx has certainly expanded from 6 locations to an outstanding 19 locations worldwide! Our goal is to make Gelmaxx easily accessible for every business and consumer. You can find our distributor locations HERE. Gelmaxx products still have quality performance while maintaining the same great price. The absorbency rate of our ECO-QUICKgel slurry solidifier has increased! We debuted with an absorbency rate around 400 times its weight, but we now conversantly state that it is around 600-700. We have certainly improved our packaging with more eye-catching designs and updated our product samples. We are pleased to introduce our AQUAmaxx slurry separator samples, which you can test on your own before you purchase our product. Our website is now filled with new videos to demonstrate the easy of use and the multiple ways that Gelmaxx products can be used. Find all of them on our website or youtube.com/gelmaxxusa. 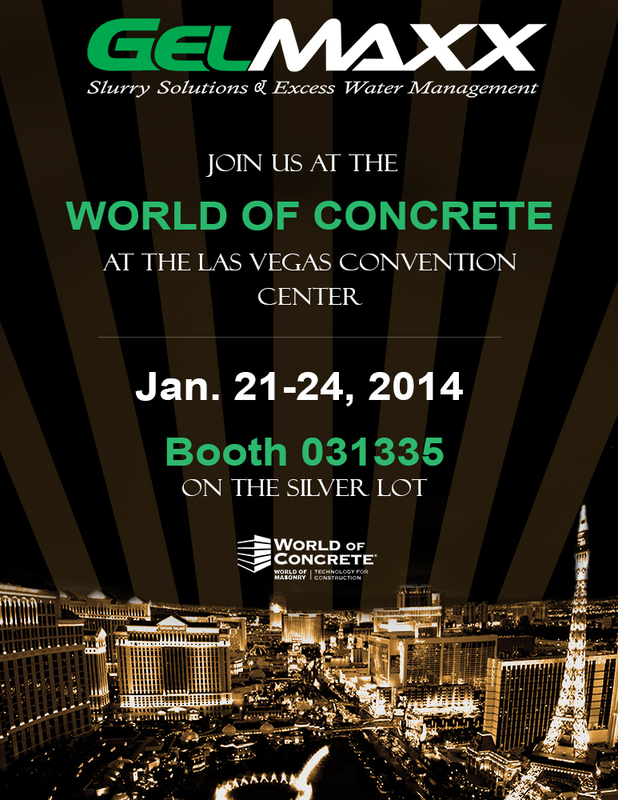 We all hope to see you at the World of Concrete! Make sure to stop by booth #031335 on the outdoor silver lot! See Gelmaxx products in action, and take home some FREE samples! And don’t forget about our FREE attendee registration by CSDA.